Mix the cheddar and monteray jack cheeses together in a bowl. 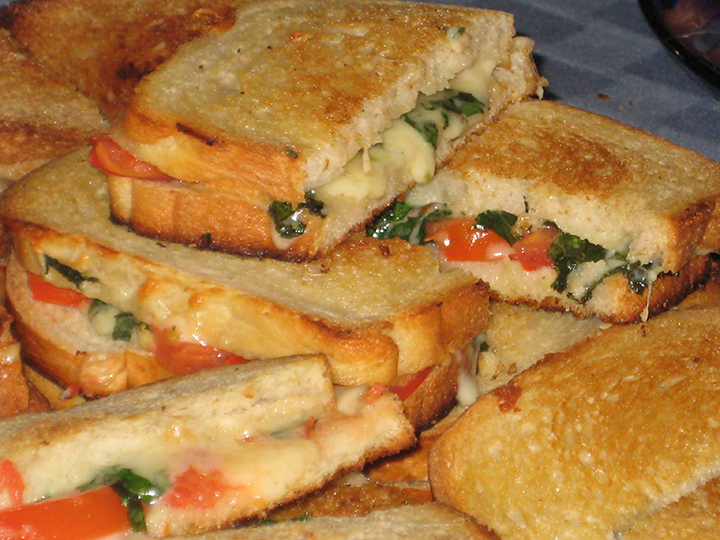 Then, assemble your sandwiches by arranging 1 ¼ oz of the cheese blend on one slice of bread, add a layer of tomato slices and top with basil. Grill/Bake/Roast as directed above. This was fantastic. 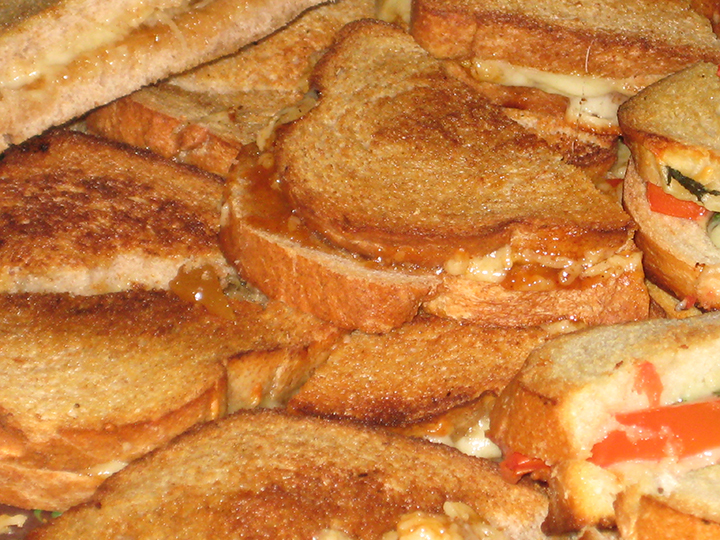 I used a mild mango chutney, but we all thought it would also be spectacular with a spicy red pepper jam. Mix the cheddar and monteray jack cheeses together in a bowl. 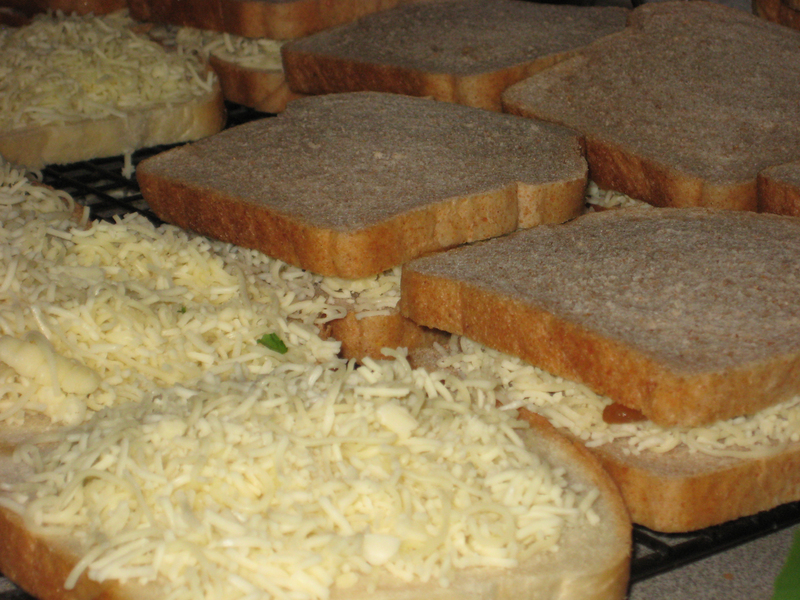 Then, assemble your sandwiches by spreading one slice of bread with the chutney (make sure you spread to the edges), and then arranging 1 ¼ oz of the cheese blend on top of the chutney. 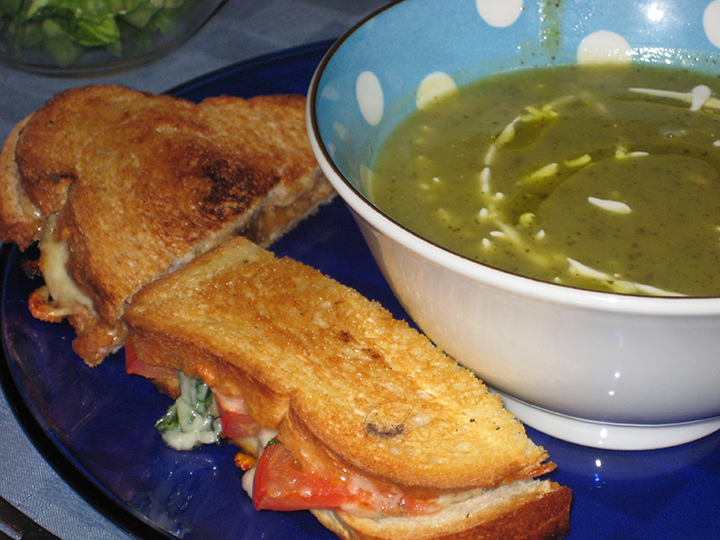 Close sandwich with remaining piece of bread, and grill/bake/roast as directed above. Part of my ongoing quest to find new ways to incorporate rhubarb into my diet. Also because I had about a pound of local rhubarb in my fridge as a result of some overzealous enthusiasm when I saw the first local rhubarb of the season. Simmer the rhubarb in the water for about 10 minutes, or until the rhubarb is falling apart. Allow to cool slightly. Combine the rhubarb with all the remaining ingredients in a food processor and blend until smooth and creamy. Adjust seasoning to taste (I used extra honey). So there’s this pie called a Derby Pie which is trademarked up the wazoo. This has not stopped anyone from recreating it at will because it’s basically a pecan pie with the addition of chocolate and bourbon. I took it a step even further from the original by substituting peanuts (nut allergy of a Dinner member) for the pecans (sometimes you see recipes that use walnuts – which, actually, I think would be nice because the slight bitterness from the walnuts would offset the sweetness of the chocolate and sugar-egg custard that holds it all together). Also, I added more bourbon, because when can you ever go wrong with more bourbon? Arrange your pie crust in a deep 9” pie plate. 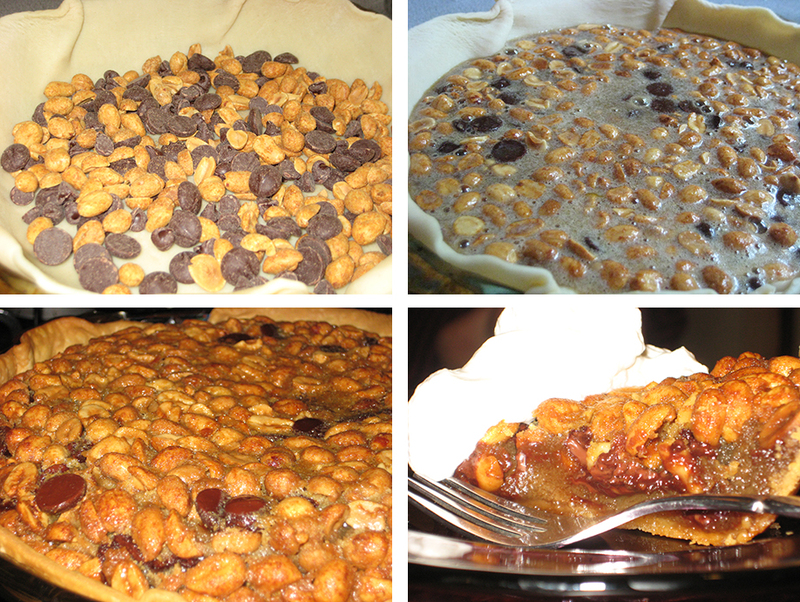 Scatter half the nuts, and half the chocolate over the crust. Whisk together the eggs, brown sugar, corn syrup, bourbon, butter, flour, vanilla and salt until well combined. Stir in the remaining nuts and chocolate. Pour the mixture into the pie shell. Bake for 40-50 minutes, or until the center of the pie is just slightly jiggly. You will need to cover the pie lightly with foil about 20 minutes into baking or you will end up with burned crust and burned filling (trust me on this). Allow to cool. Pie can be made a day in advance and kept at room temperature. Reheat (if desired) at 325 for 10-15 minutes. * If you are using pecans or walnuts I would leave half of them whole, and roughly chop the other half. I found peanuts small enough that this was unnecessary. Because as noted above, when is more bourbon ever a bad idea? And, please let me tell you that all whipped cream should involve bourbon, and it’s possible I will never make whipped cream without a generous slug of bourbon again. Combine all ingredients in a bowl and whip until the cream forms soft peaks – you can do this by hand in about 5 minutes, or use a stand mixer/hand held mixer and save yourself the arm strain. Add more sugar/bourbon to taste.